Raised in a musician’s family, he has always been in contact with the material of sound and he very quickly experimented with cassette recorders and all the instruments he had around him. He studied in various fields (classical piano, classical percussion, jazz drums, dante agostini, Royal Conservatory of The Hague) and eventually combine his first way of being into music (more experimental) with more common practices. For the moment he plays in the group Going (with Giovanni Di Domenico, Pak Yan Lau and Joao Lobo) with whom they have toured Europe and produced three albums. He is part of the Orange Moon trio with Hendrik Lassure and Manolo Cabras. He toured China with Giovanni Di Domenico, with their duo Kalimi, which allowed him to meet Akira Sakata. This meeting plus Manuel Mota gave the record “Jomon” released by Holidays Record in 2017. 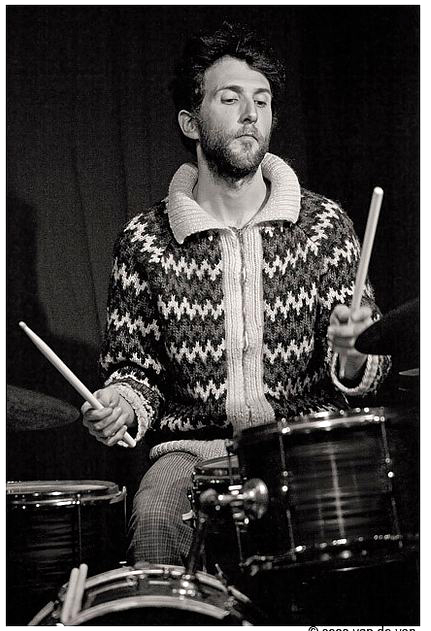 Mathieu has played with Darin Gray, Toma Gouband, Yan Jun, Lynn Cassier, Alexandra Grimal, TrashVortex Electronic Ensemble, Miguel Angel García, Sanne Van Hek, Manja Ristic and many others. He began working in the contemporary dance field in 2012 with the company Ballets Confidentiels. He was then invited as an external eye and ear for the project “I choke, you choke…” by choreographer and voice artist Ine Claes. He will participate as an assistant composition and musical accompaniment for Ine Claes’ new piece with Fabienne Seveillac, Andreas Halling, Aloun Marchal. He has worked on sound installations: Ondulo (with Toma Gouband, 2013), Klankenbos Nocturne (with Pak Yan Lau, 2013), Les Aires (by Fabien Gruau, 2014), Disappearing (by Manja Ristić, 2011), Balade au bord du Gave (by Mathieu Calleja, 2012). Films / Theatre music: “White City Speen” Delta-T Production (Movie by Alfred Rambaud, 2011), “Laissez-moi seule” production théâtre de la Colline (Paris, 2009).